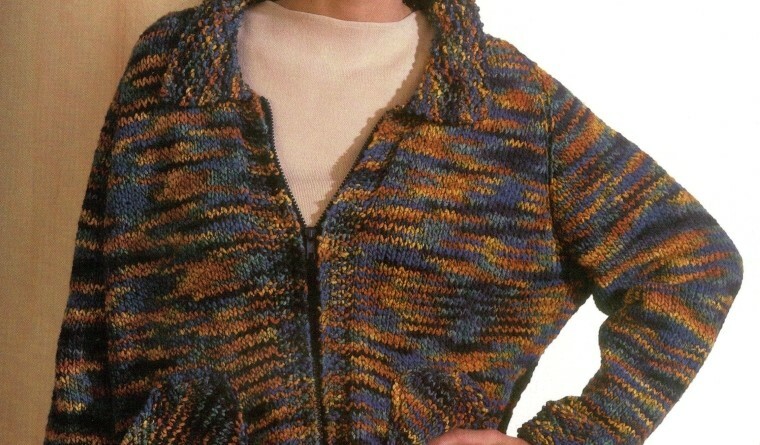 This adorable Jacket is worked from the neck down with diagonal packets in Schaefer Yarn`s DonnaJo. To fit Misses sizes Small (Medium). Directions are for smaller size with larger size in parentheses. If only one figure is given, it applies to both sizes. Finished Bust: 43 (49) in. Back Length: 171/2 (18 1/2) in. Circular knitting needle 16 in. long in size 11 U.S.
One set of double-pointed needles in size 10 1/2 U.S.
13 sts and 20 rows = 4 in. with Schaefer Yarns DONNAJO and smaller ndls in St st.
RL inc = Right Lifted increase: K into right loop of st one row below next st on LH ndl (then k st on ndl as usual, include this st in count). LL inc = Left Lifted increase: K into left loop of the st two rows below last st knitted on RH ndl. Wrap and turn on purl row: Bring yarn to back, sl 1 st from LH ndl to RH ndl, bring yarn to front, sl st back to LH ndl and turn work. Wrap and turn on knit row: Bring yarn to front, sl 1 st from LH ndl to RH ndl, bring yarn to back, sl st back to LH ndl and turn work. 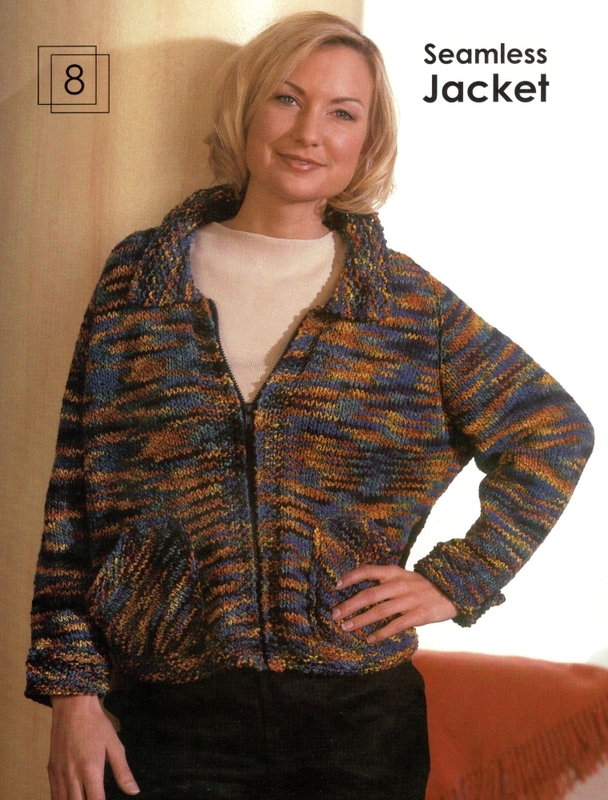 NOTE: Jacket is worked from the neck down with no seams. Neckband: With 32 in. circular ndl, CO 61 (73) sts. Work 6 rows seed st for neckband. Beg yoke: Row 1 (WS): Work 5 seed sts, p 11 (14), place marker (pm), k 1, p 1, k 1, pm, p 23 (29), pm, k 1, p 1, k 1, pm, p 11 (14), work 5 seed sts. Row 2: Work 5 seed sts, k 11 (14), LL inc, sl marker, p in front and back of next st, pm, k in front, back and front of next st, pm, p in front and back of next st, sl marker, RL inc, k 23 (29), LL inc, sl marker, p in front and back of next st, pm, k in front, back and front of next st, pm, p in front and back of next st, sl marker, RL inc, k 2, wrap and turn. Row 3: *P to marker, sl marker, k 2, sl marker; rep from * 3 more times, then p 3, wrap and turn. Row 4: *K to marker, LL inc, sl marker, p 2, sl marker, RL inc; rep from * 3 more times, then k 4, wrap and turn. Rep Rows 3 & 4 inc number of sts after last marker with each rep until all k/p sts of fronts are incorporated and only seed st front bands are still unused. Next 2 rows: Work to end of row including seed st bands. Cont working first and last 5 sts in seed st and incs as est until st count bet markers equals 37 (42) / 2/ 47/ 4/ 65 (75) / 2 / 47 / 2 / 37 (42) and piece meas 7 1/2 (81/2) in. Next row: Note: Remove all markers as you come to them. Work 37 (42) front sts, place next 51 sleeve sts on a holder, CO 1 st for underarm, work across 65 (75) back sts, place 51 sleeve sts on a holder, CO 1 st for underarm and work 37 (42) front sts -141 (161) sts. Body: Work even with first and last 5 sts in seed st and sts bet in St st as est until body meas 10 in. from underarm. Maintaining est pat, dec 16 sts evenly across next row. Work 8 rows in seed st on all sts for lower band. BO loosely in pat. Place sleeve sts on 16 in. smaller circular ndl. Join yarn. 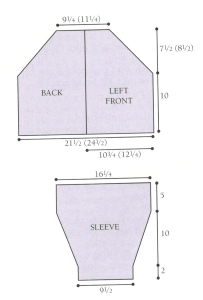 PU 2 sts in underarm, pm, cont around Sleeve – 53 sts. Join and k every rnd for 5 in. Dec rnd: Work to 2 sts before marker, k2tog, sl marker, ssk, finish rnd. Rep dec rnd every 6th rnd 2 (4) times, then every 4th rnd 9 (7) times – 31 sts. Note: Change to dpns when sleeve is too small for circular ndl. Work even until sleeve meas 14 (15) in. from underarm. Split cuff: K 16, turn. Work back and forth in seed st rows on 31 sts for 14 rows. BO in pat. With RS facing and 16 in. smaller circular ndl, PU and k 61 (73) sts along top of neckband. Work 6 rows seed st. Change to 16 in. larger circular ndl. Cont in seed st for 12 more rows. 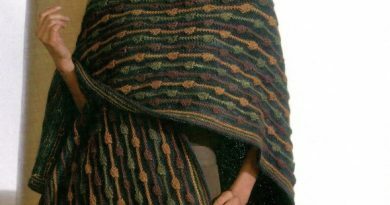 Note: Collar will lie nicely if last few rows are knitted loosely. BO in pat. With 16 in. smaller circular ndl, CO 1. (K, p, k) in this st.
Row 1: K 1, yo, k to 1 st before end, yo, k 1. Rep Rows 1 & 2 until there are 29 sts, ending with a p row. Beg dec as foll: Row 1: K 1, k2tog, k across to 3 sts before end, ssk, k 1. Rep dec Rows 1 & 1 until 23 sts rem. Change to seed st and cont decs until 17 sts rem. BO loosely. Fold back cuffs and tack in place. Sew pockets to fronts aligning bottom edge with top of lower band and pocket side 2 in. from front band. 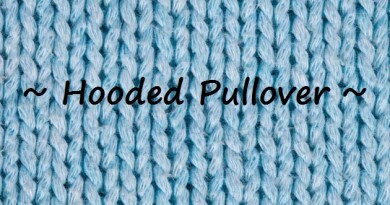 Stitch through holes to leave a row of knit as a decorative edging.